Music Hunter is a free social music browser app for the iPad that helps the user discover new songs, bands, or even genres of music through an uber-elegant visual design. While this app is not totally unique (Aweditorium shares many features) where Hunter shines is in its ability to customize the user experience. 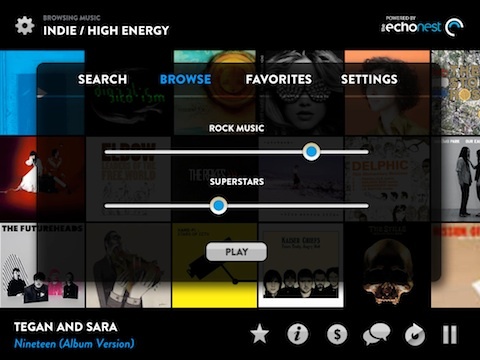 The technology behind Music Hunter is powered by The Echo Nest. Much like the music genome project that powers the popular Pandora applications, The Echo Nest technology maps music by finding similarities between different bands and genres. Besides Hunter, the platform is also the brains behind other popular apps like MTV’s Music Meter and the BBC’s Music Showcase. Upon opening the app, the user is greeted with a random sampling of album covers for various bands in different genres. The user presses on an album cover and a song matching the search criteria from that band begins to play. If you like that song you can add it to your favorites list in the app, read the artist bio, and buy the track via iTunes or 7digital. You can also Tweet or Facebook comment about the song to your friends. Finally you can reset the search criteria to find music similar to the particular song, all with the buttons located along the bottom of the app. Unlike Aweditorium, Music Hunter let’s you search for a particular band or artist, and even filter searches by genre and style. The choices seem rather silly, but you could filter for classical music that is “really loud” or Emo music from the 1960s. By default, Hunter filters by any style in any genre. Playing with the filters did yield different results each time, so there must be some method behind the madness of the filter choices. But how will the Music Hunter app lead you to new music? By using its keen ear for similar music thats how! For example a search for The Killers yielded several of their songs but also results for similar bands, many new to me including Traffic Sound, Hard-Fi, Razorlight, Team Sleep, and some old forgotten favorites like Semisonic and the Yeah Yeah Yeahs. A search for Widespread Panic yields the usual wannabes like North Mississippi All Stars and Phish, and the results also pulled songs from Train, The Black Crows, and The Marshall Tucker Band. Music Hunter reminded me why I’m a fan of Panic and Train. Another nice feature that I’ve come to use more and more is the refresh button. I don’t know what it’s proper name is, but pressing this button located along the bottom of the app while listening to a song or new band you like will place that band in the search box and repopulate the results. This helps me venture out farther from my music comfort zone. I really can’t complain about the form and function of the Music Hunter app. It does what it should with a simple elegance totally lost on some of it’s competitors. I would like a few updates. First I want to see an option to view the band catalog or maybe the back cover of the album to get an idea of what their other songs are. Secondly lyrics integration and maybe tour info as well. For the snobiest of music aficionados to those who never venture off the top 10 list, Music Hunter for iPad is a must have app for your audible excursions. AppSafari review of Music Hunter was written by Clark Stewart on June 23rd, 2011 and categorized under App Store, Featured, Free, iPad apps, Music. Page viewed 4217 times, 1 so far today. Need help on using these apps? Please read the Help Page.